#4 milled Zephyr Phillips insert bit, 1/4'' hex shank, industrial extra hard, 1'' overall length. Zephyr Phillips insert bits are manufactured using a proprietary steel and heat treat process that yields greater strength and a longer bit life. The cutting-edge machining process used to manufacture Zephyr Phillips insert bits results in tighter tolerances, superior product consistency and a better and more consistent fit to fasteners leading to better torque transfer. The ZEPHYR D1224XM #4 Phillips Insert Bits, 1/4'' Hex Drive is one of thousands of quality tooling products available from MRO Tools. 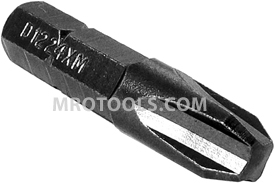 Please browse Zephyr Phillips Insert Bits for tools similar to the ZEPHYR D1224XM #4 Phillips Insert Bits, 1/4'' Hex Drive. ZEPHYR D1224XM #4 Phillips Insert Bits, 1/4'' Hex Drive description summary: ZEPHYR #4 milled Phillips insert bits, 1/4'' hex shank, industrial extra hard, 1'' overall length. * Quantity discounts may be available for the ZEPHYR D1224XM #4 Phillips Insert Bits, 1/4'' Hex Drive. Please contact MRO Tools for details.